Jeremy David Tarrant is increasingly recognized for performances consistently hailed as elegant, compelling, warm, communicative, and powerfully artistic. Since 2000, he has served as Organist and Choirmaster of the Cathedral and prior to this appointment he served as the Cathedral’s Assistant Organistfrom 1994. In April of 2007 he was seated as Canon Precentor of the Cathedral in thanksgiving and recognition of his role in the liturgical and musical life of the Cathedral community. He is the founding director of the Cathedral Choir School of Metropolitan Detroit. A student of the American organist and pedagogue Robert Glasgow, Jeremy David Tarrantis a graduate of the University of Michigan School of Music where he earned the Bachelor and Master of Musicdegreesin organ performance and sacred music.His other instructors include Betty R. Pursley, Corliss Arnold, and James Kibbie. He has had additional coaching with Lynne Davis. Mr. Tarrant is Adjunct Professor of Organ at Oakland University. He is in frequent demand as a teacher and clinician, and regularly serveson the faculties of the Royal Schoolof Church Music summer coursesas well as the American Guild of Organists summerPipe Organ Encounters. 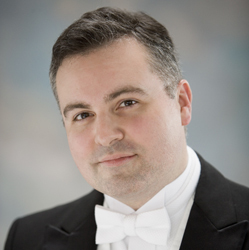 An active concert organist, Jeremy David Tarrant has performed widely in North America in such venues as the Washington National Cathedral; St. Thomas Church, Fifth Avenue; St. James Cathedral, Toronto; St. Patrick’s Cathedral, New York; and Chicago’s famed Fourth Presbyterian Church. He frequently appears with the Detroit Chamber Winds and Stringsand has performed in regional conventions of the American Guild of Organists. In 2008, Mr. Tarrant made his European solo debut with a recital in the Cathédrale de St. Etienne in Meaux, France, and in 2011 he played the closing recital of International Organ Week in Dijon, France. In 2012, he was a featured artist in the Pine Mountain Music Festival, presenting three solo recitals in Michigan’s upper peninsula. He is currently engaged in a series of six concerts on important instruments in Detroit. His debut solo recording of Widor’s Symphonie VII, along with music of Litaize and Vierne was released in early 2018 to enthusiastic and critical acclaim. In July, 2014 Mr. Tarrant conducted the Cathedral Choir during its residency at Chichester Cathedralin England. This tour included concerts and services in Canterbury and Southwark Cathedrals. On the choir’s two CD releases, Nowell Sing We, and Evensong for All Saints, he is featured as organ soloist as well as conductor.